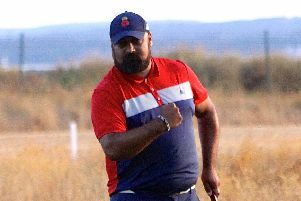 Having won the south east qualifier eight times since 2002, Hampshire – as the reigning English county champions – were there to be shot at the Romford course on Saturday. Following the kind of run that saw Surrey dominate the south east group after the war – with an unprecedented run in Hampshire’s history of seven wins in the last 12 years – new captain Colin Roope always accepted there was a realistic chance the men in light blue might find a fourth successive victory a step too far. And while no stone was left unturned in their preparations to win at Orsett, it was Berks Bucks & Oxfordshire who prevailed. The 37-year-old was still very proud of his team’s display in the sweltering heat, though. Roope played in two English finals for Surrey before switching to Hampshire after moving to Horndean in 2016. And he was a member of the team that ended a 21-year fruitless quest for a second English County Championship at Trevose last autumn. He said: ‘It is not our god-given right to win this event every year and all I can do is congratulate BB&O on playing very well and shooting a very good score. ‘We still finished second – six ahead of Kent and nine ahead of Essex on their own course. ‘I would not change a thing about the team I picked or our preparation. ‘We did almost exactly the same things as the winners – we were hitting the same clubs on most holes, so we had similar game plans. ‘They just had their day when everything went right and the putts that mattered ended up in the hole. ‘Out of 66 players, we had a tied 34th, a tied 25th, two tied on 19th and two in the top five. ‘We did not play badly by any stretch of the imagination, so we can have no regrets. ‘Nobody can say it was their fault that we lost. We all needed to take one shot less in each round, which is not a lot at this level. ‘I take my hat off to BB&O and wish them every success in the finals.